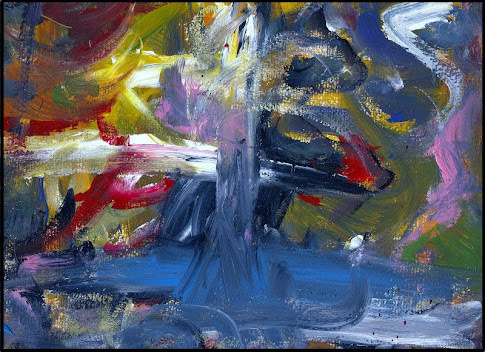 This the third painting in my "Textural Abstract" series. It is acrylic paint and mediums on 24" x .75" x30" canvas. 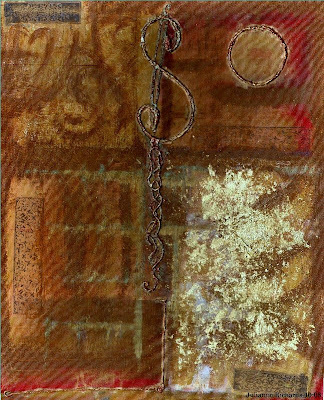 Earth tones mixed with Gold-leaf and textured images painted with acrylic interference green, on layers of glazes (Golden Acrylics) with gold, burnt umber and sienna...This is a multi-layered and mixed media piece that may still be "a work in progress." I have several more unfinished pieces, and with that, it is back to the easel! This is lovely and so full of warmth. I find the composition so appealing and leading. I love the softness and the nod towards music, then the explosion of gold which just balances the whole thing.